I know they say “it’s just a game”, but right now it doesn’t feel that way. It’s my own fault. I just got too wrapped up in the Superbowl this year. The Forty-Niners have been my favorite team my entire life. 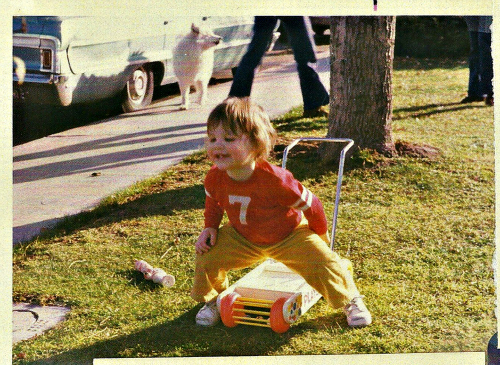 Here I am dressed up for game day, back in the 70’s before any of the players on today’s Niner team were even born. One of my most vivid memories growing up is watching football with my dad. The Niners were our team. Even when I no longer lived at home, we would talk almost every Sunday of football season and rehash the game. When the Niners won the last playoff game against Atlanta and were headed to the Superbowl, I cried…a lot. At that moment I realized, it was more than just a game for me. It was about life, and loss, and childhood memories, and just wishing more than anything that I could call my dad. Yesterday morning, I was so ready for the game. I had all my good luck charms – my lucky pajama bottoms (that I wore each time the Niners have won a playoff game in the past couple of years), my Jerry Rice jersey (that I had worn the last time the Niners won the superbowl), and my dad’s 49er hat. I even found my little forty-niner jersey from the photo above. We put it on our dog Fang (the dog that was my dad’s and now lives with us). We were ready for the game. I was convinced that my dad was smiling down and the Niners would win. Sadly, that did not come to pass. Their comeback was just not enough. But as I was cleaning up last night, when everyone had left the party and the house was quiet, instead of sadness, I felt an odd feeling of happiness and gratitude. 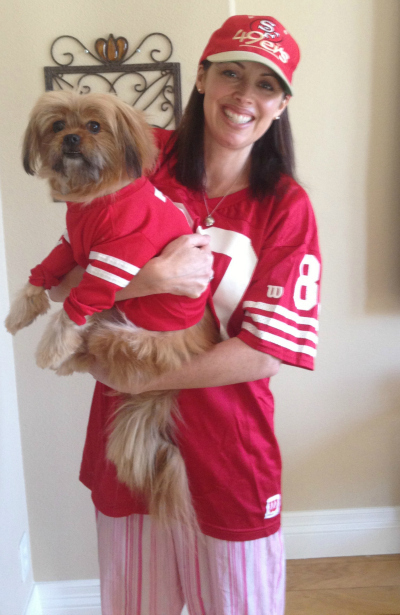 I thought about all the friends and family who have supported me and my Niner craziness this season. I thought about the room full of people cheering on the Niners – not because they really cared but because they care about me. From my daughter making 49er cupcakes, to my husband getting me red and yellow flowers; to friends who painted their toes Niner red and gold, or made me an authentic 49er king cake, or sent me a video from the Superbowl of Joe Montana saying hi to me; these people were supporting me. That is what I love about the game, how it brings family together, how it brings friends together, how you support your friends by cheering on their teams. That is something that would make my dad smile for sure. So despite the crushing loss (that yes, still hurts), it is a win in my book in the end. Posted in Loss and Grief and tagged 49ers, childhood, fan, Forty Niners, memories, Niners, Superbowl. Bookmark the permalink. You have such an amazing perspective. I was cheering for the 49’s because of you too. I love to read everything you write. Thank you Lori! I love that you were rooting for the Niners. That’s awesome. It was great to have you Jeff, and of course, your queso. Yummy!